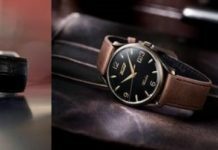 To celebrate the historic partnership between the NBA and Tissot, the brand introduces a new special edition Chrono XL featuring a strap made with the same leather used for official NBA Spalding basketballs. This new Chrono XL timepiece is a collector’s dream as it comes in a special watch box that holds interchangeable mineral crystal case back inserts for all 30 NBA teams (the watch comes fitted with the NBA logo). A basketball-shaped tool makes it easy to switch these special medals in seconds. 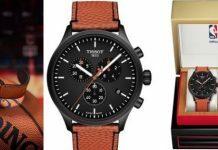 Tissot is the first watch brand to partner with the NBA, as official timekeeper (with special branded shot clocks) and as the NBA’s official watch. This special edition commemorates this collaboration in stunning style. 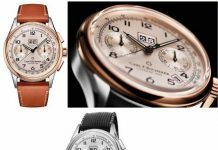 The 45mm stainless steel Swiss Made quartz chronograph features basketball-orange colored hands, including the chronograph hands.